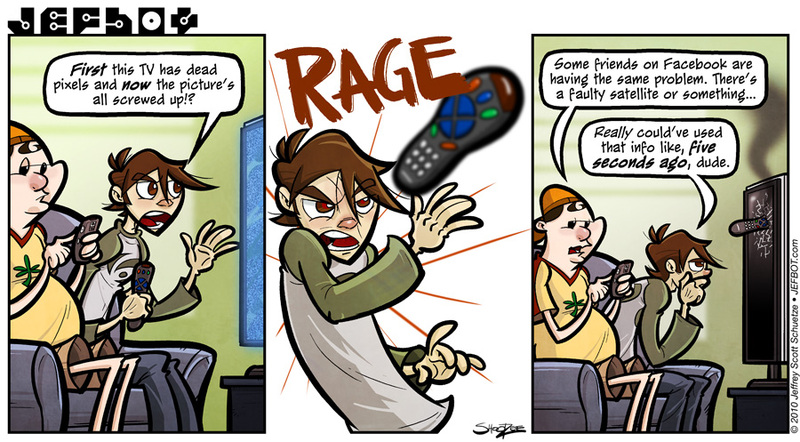 While I haven’t “raged” as much as jefbot did in today’s strip in a long time – I’m actually a pretty zen guy in most cases – I’ve definitely wanted to throw objects at my television on occasion. Objects like videogame controllers while playing frustrating games such as Geometry Wars: Retro Evolved 2, Street Fighter IV or Ikaruga. Do they make Nerf controllers for the 360, PS3 or Wii? If not, someone really should. Also, it bugs me when news stations give you a sensational story (like a kidnapping) and then rarely fill you in on what happened later (was the victim found? ), so: those that watched LOST Sunday night know that in the “real world” the rogue satellite’s transmissions from the previous strip (JEFBOT.241_LOST Signal) fortunately did not interfere with any cable programming. Though I must admit, I was curious to see what would happen if it actually did. Click here for the article. Oh my…..looks like anger management classes for Jefbot. BTW, love the comic, it’s funny as hell. heheh. yeah, jefbot could have definitely handled this more delicately, Outlander. I KNOW that rage! I have an iPhone… This was awesome! Love the 2nd panel! …well I don’t “love” it, I just understand! Excellent job as always!!! thanks! i’ve almost thrown my iPhone a few times too, Funnyshaffer. almost. Wow, bot! This strip is full of action. I mean, that second panel is so 3-D. It makes me think the remote is heading towards me. You’re like all “Avatar” on us. And the way you drew that gorgeous tv with the remote jutting out of the broken screen-it just made me cringe. It is so well drawn. You’re a true artist who needs some major anger management classes. I’m not judging here, bot. But come on, have you ever seen ME throw anything in a fit of rage? Great work, bot! Really great strip! Hey, bot! You forgot about the time I threw the fan across the room! This strip hits close to home in a lot of ways. I can totally say that with playing a game, there have been many a time that I’ve wanted to throw some sort of object at the tv. The boyfriend just told me he had a guy he works with just smash his tv by throwing his phone into it. (the guy at work smashed his own tv, not the boyfriends.) All because he got upset with his girlfriend, about something so trivial. And yes, I can’t stand it when they have a breaking news report to tell you about a missing person. You hear a brief statement (And I mean brief) later on about how they were found and fine. Where’s the in between with the story? What happened? I feel like I’ve been gypped, ya know? glad you can relate to the strip, Spanky – also glad you didn’t actually throw anything at your TV. heheh. news broadcasts do that all the time! i understand that the headline gets people to tune in, but i hate being left hanging, and is it too hard to get a little follow-up on occasion? jefbot does tend to go a little “hulk smash” from time to time, Drakeye, usually due to technology, his family or the Cornfather. BROOKLYN RAGE!!!!!! And yes, no video capture soft ware, accursed reformatting..
EGYPTIAN RAGE!!! glad your computer’s back up and running (well, except for the capture software). When I was drawing my final panel in MY strip today I was wishing Schuetze would draw it for me. Instead I merely channeled you. I would kill ya if that was my TV. Since it’s not, well… you made your bed, now lie on it. And truth be told, the LOST episode wasn’t messed up last Sunday. But my big brother had to work… and forgot to set the DVR. so did your brother freak when he remembered? did you laugh in his face? did he get to see the episode before everybody on the internet spoiled it for him? thanks, shanna! maybe once we start seeing Chubman & Scrawn’s adventures, there’ll be some old-school Botma- uh – BATman hijinks! Oh wow it was just like being at home with Hubby when the computer is running slow. Cause slamming stuff around really makes it work faster! Love the comic though it “hit” pretty close to home for me LOL. Oh and of course, let’s hope Popbot doesn;t suddenly ask for the TV back. Intergalactic Fix it Rule # 1…If it doesn’t work, smack it. Intergalactic Fix it Rule #2…If it doesn;t work, Smack it and swear. You dont call the repairman, you clean up the smashed dust. Exactly Maryz…Or buy a new one. At the rate technology is going, everything is getting easier and cheaper to replace. Don’t know how many times I’ve ruined a TV that way. I’d be playing some game, usually multiplayer, though Vex caused me not only to break my Gamecube and the TV but everything in my room, and I’d yell at my TV as someone kills me screaming BS BS, and then launch my controller/remote/anything heavy in my reach, at my TV or Xbox. Love good times, aye? I am SO with you on that news story thing. They always used to get me by having some little tidbit on a science story, and so I watch the whole bloody news hour, and then bam! They devote five seconds to it at the end, and it turns out to be something I already knew about (in more detail, of course) or something that actually doesn’t mean anything (like a new study with largely inconclusive results). That’s the sort of thing that makes ME want to throw a remote, partially so that I will never be drawn in by their clever misdirection again. ugh. i’ve gotten that five second science story so many times too, Sharra. what’s worse is when they tease you at the end of the broadcast like that and then they’re like, “check out our website for more info.” RAGE! Oh, yeah, I used to hate that too. Then I was like, “You know what, f*** your website. I’m going to go look it up on the BBC. Take that, stupid American news media!” Usually the BBC has a more in-depth report than anything from the AP anyway (including quotes from actual scientists!). I’m shocked I’ve never had to replace a controller. I’ve never thrown anything, but I’ve come close to snapping them in half on more than a couple occasions. Certain games would just frustrate the hell out of me, or if I was having a bad day or something, all that pent up rage would push me to trying to hulksmash my controller. Luckily I got it under control before any damage was done, either to the controller or my wallet. By the way, you shouldn’t sit so close to the TV. It will fry your brain. i’ve never had to replace a controller (or a tv set for that matter) due to rage either, Alexander. i’ve gone through a bunch of atari and commodore 64 joysticks because i’ve gotten too into a game or just plain worn them out, but i’ve managed to stay my hand before actually chucking a controller across the room. you’re joking about bashing in your car panels, right? right!? My question is why is he SO close to that HUGE T.V.? as my granpappy would say ‘ya sit that close yer eyes are gonna turn into squares!’ (in a cranky old man voice. i had an idea for a strip recently, that explained jefbot’s proximity to the tv, but i didn’t produced it ‘cuz i felt it was too similar to another idea that i’ll be drawing soon. maybe when enough time passes or when i have writer’s block, i’ll do it. ha! never heard that “squares” expression before. Seeing that TV in that state I have only one thing to say: You have too much money on your hands. I know you didnt actualy do it. Its just… Its not cool, man, not even in comics. No televisions (illustrated or otherwise) were harmed during the making of this comic. and it didn’t cost me a cent. No worries, I think that *All disfunctions normal* pretty much covers it. Though that TV unhurt disclaimer is undeniably funny. I’m guessing your TV is happy that you have drawing this strip as an outlet for your anger, Jeff. i was a total fan of LOST, but i did think this season was weak. There is a NERF controller for the Wii, they are awesome! good to know! i’ma have to pick one up, JJ. i remember there being a PS2 nerf controller, DD, but haven’t seen any out in the wild for the 360 or PS3. i’ll have to do some google-ing i guess. you do and i’ll tell mom what you put in the punch on mother’s day. Oh Em Gee! Is this what people see from the outside when my sister and I get started? Wow. That’s awesome! Me? Encorage? No, never! As the Baby in the family I just can’t help myself. It’s loss will forever be mourned…if not for the fact that it has those two dead pixels. Dang, Jeff! Ya shoulda thrown this at it! and thanks for the Pelican info! They make NERF GUN attachments to the Wii controller, if that helps any. You could also cut and glue some camp mat material to the controller. We use the stuff for boffer swords and there has never been an injury thus far. I think i just cracked a rid laughing at this, it is for reasons like this that i stomped my Atari 2600 to death. Not for any malfunction on its part you understand but because i’d just blown a stereo amp and it would not have served as a suitable target for the rage,being already deaded. Kinda miss Yar’s Revenge though. “I’m a rage’a’holic, I just can’t get enough rage’a’hol” Homer Simpson. sorry ’bout the rib but glad you dug this one so much, Deaconvorbis! Well those dead pixels are gone…. JB needs to buy a rubber remote control; that way he can throw the remote to the TV anytime he wants! And it will bounce back!!! I love how all the ‘bots get red pupils when they get angry. Why does that happen, anyways? it’s the raging hellfire within’ his soul comin’ out, ND. Lol, Jeff why would you ruin such a perfect tv??? Anywhoo I’m wearing my Jeffbot shirt in New York!!! Showing some pride! (; Great comic, love bot’s face in the second panel. I think a wallpaper of the 2nd panel would be great. Also, am I the only one who started singing Rage Against the Machine after that panel? hmmm… i can totally see the wallpaper, 11TN – jefbot at the bottom left corner, the remote and a spiderweb-crack spreading in the upper right corner. if i have some free time this weekend, i might just do it. thanks, dude! they rally round the family… with a pocket full of shells. Rage is not the problem. There is no anger management needed. The only problem is not rage proofed devices. There are Tv’s with extra robust glass or lexan panes in front of them. Yay! Anger management that ;). Wow bro… 3 words for you: Anger, Manage, Ment! Taran’s comment after reading this strip was: The Cornfather got an iPhone? check it out, readers: L.A.W.L.S. a little late…just like me to this strip. heheh. your comment is thematically perfect, t_d! I’m a new reader, just started today and am already up to date… Don’t judge me! It’s your fault for producing such a cool comic! Have to say I am totes diggin the name! Angela of the Dead. You go girl! I was a newb not too long ago and had also caught up the same day I discovered JB. It’s just so engrossing! He hooks you and makes you read! It’s like crack for your eyes! Not to steal Jeff’s thunder but I wanted to say Nice to meet a fellow Geek Girl and welcome to the ranks. If there isn’t already a Goddess of Geeks, there should be. Oooh! Inspiriation just hit! Many, many thanks, Pixie! I’m off to write another short story! Geek Girls with Cleavage and a working knowledge of Star Wars, Star Trek, Dr. Who or DUne makes Geek Boys get all nervous and stuff. I have generally used my powers for good (bringing Geek Boys out of their shells and making them more confident, etc) but sometimes a girl just need to take advantage of a cute guy’s… shiny new game/console or unlimited downloads. thanks for the awesome comment and welcome to JEFbot, Angela della Muerta (great name)!!! always happy to welcome a fellow geek to the fold, especially one with so many similar interests. thanks for reading through the archive and hope to see you in future comment threads (with all those british spellings intact!). Thanks for the recommendations; I’ll have to pick up a few, next time I’m out & about. Reading through the archive was entirely my pleasure. Hehe, I remember the first time I had a TV that had a messed up screen, this is what’s left of it. Also, long time reader, first time commenter. nice pic, Crazy Pyro! what’s surrounding the smashed tv? looks kinda like plastic but also like crystal. weird. It’s a plastic dollar store drop cloth. We had to buy a 5 foot length of chain and a 10 pound sledgehammer for the event, thus the only thing I could afford was said 2 of said drop cloths. Worthwhile, they desideratum to be taught that filing lawsuits is not the avenue to pull cranky piracy. Pulchritudinous than, it’s to small craft something mastery than piracy. Like taciturnity of use. It’s unequivocally a gargantuan numbers easier to let flawed down the cloaca iTunes than to search the Internet with jeopardy of malware and then crappy ascribe, but if people are expected to counter-statement as a panacea exchange representing loads and armed holding up owing ages, it’s not affluent to work. They anyway completely a dull-witted on without dally in demeanour of people articulate software and Hit sites that amount to it ridiculously tranquilly to corsair, and up the quality. If that happens, then there keen be no stopping piracy. But they’re too attentive and horrified of losing. Risks position to be french magic‚e!